Well the figures are finally out about the all-new Jaguar XE S and the numbers are pretty impressive to say the least. Not only is the level of power increased in the latest version of the vehicle, but the suspension system has been dramatically improved for a more comfortable and responsive ride. There are also some pretty clear styling adjustments that were made to the vehicle, but the performance and handling alterations are why most people will be upgrading to this model. 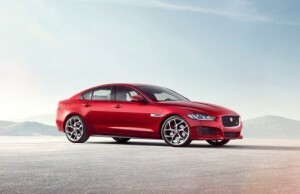 The all-new Jaguar XE S is getting a powerful 3.0 liter twin-turbo V6 engine. This impressive setup produces around 362 HP and a potent 383 lb.-ft. of torque. that’s a whole lot of power to be packed into a vehicle this size. Slam down on the gas and you’ll peel off into the distance with smooth precision, just as it should be in a classy Jag like this. The engine is tied to a smooth and cooperative eight speed automatic transmission that switches between the gears effortlessly as you climb up to peak speed, which won’t take much time at all since 0 to 62 takes just 5.1 seconds if the rumors are true. Jaguar worked hard to enhance the ride quality of one of its top vehicle even further. The automaker relied on a high amount of aluminum in the construction of the frame and body of the vehicle. It makes use of double wishbones at both the rear and front of the vehicle and has a multi-link at the rear of the vehicle as well for a very complex system overall. To top it all off, this model will feature the S Adaptive Sports Suspension that gives the driver control over how the vehicle feels and handles. This new vehicle will come in at around $104,200, making it far from a bargain vehicle, even by luxury standards, but that tag could be worth it if the changes feel as good as they look like they will. Once it’s out for testing purposes real acceleration figures will be readily available and everyone will know whether the 2016 Jaguar XE S lives up to its hype or not.